Hello everyone. Welcome back to The Arcane Sanctum. I hope you all are well, and doing well in preparation of bigger tournaments coming up later this spring. Normally I discuss various decks from the formats in the game, however today I want to talk about another aspect of this collectible card game we play: the finance. Before we dig in I do want to mention that I am no expert in the field of finance, and my thoughts are only my observations from what I am seeing going on. There are many of us who play the game, who collect the game, and then there are those who buy & sell the game. No these aren’t necessarily retailers, but are mostly people who buy cards low then sell high. Very similar to stocks in that high level view, and the finance part of the game has had a pretty big impact on the cost of singles for the last 5 years (the last 2-3 seem to have been the biggest impact). What many are seeing though currently is less “buy low sell high”, and more manipulation of the singles market which has a negative impact on many. Market manipulation is a deliberate attempt to interfere with the free and fair operation of the market and create artificial, false or misleading appearances with respect to the price of, or market for, a product, security, commodity or currency. How this relates to Magic singles is that individuals will buy all of the cheapest copies of a card available, and then sell them back at a higher price thus artificially inflating the card’s value. This causes people to panic buy, and even others to panic sell in the hopes of getting the high price before the card price comes back down (assuming that happens at all). Often times what occurs when a card is bought, and relisted, is the card remains at the higher price until it climbs again which then starts putting people out of reach of obtaining the card. While the consumer aspect is a large impact this also has a negative impact on stores. If a card spikes in price due to this artificial inflation, and then someone trades a bunch of those cards in for what the store has in stock, then has the store gained any money? Maybe. That often times depends on the cards being traded in, and their demand. If a store can’t sell a high priced card then they are sitting on stock that’s not moving which is bad for the store’s revenue. Fortunately a lot of stores are on sites like TCGPlayer to counter this from happening, but not all of them, and these situations can negatively impact them if they are not on top of price spikes or trends. Interest or change in formats can also get the market manipulators involved as well. From the unbanning of Bloodbraid Elf a few months ago, cards not being reprinted in Masters 25, cards doing well at large events, and to the increasing interest in formats such as EDH and 93/94 (a format where decks can only be constructed from cards printed in 1993 through 1994) changes and shifts throughout the game can cause people to get on board in hopes of making a profit. Suddenly one day you could have a card that was under $10, and the next morning it’s near $75. There are times the card will snap back a little, especially when not on the Reserved List (more on that in a moment), but it will never reach the levels it was. Sometimes it will stabilize at double what it was before the spike, making obtaining the card more difficult. Ball Lightning was a card, in it’s original printing from The Dark, that one could obtain a near mint copy for about $8 from most retailers (if not less). Some retailers may have sold it for less than that as it’s stock in the store that may not be moving. This card has been reprinted in packs 4 other times with it’s most recent printing in Magic: 25. The card was bought out over time, and listed at an arbitrarily large price ($220.00), and remained at that high price until people started posting cards online for the proper price based on the card’s availability & amount of play. Once that happened the card was bought out again at the lower price to maintain it’s now current higher price. If you look at the list above, and exclude the Beatdown Box set, Judge Promo, and Premium Deck listings (because none of them were available in boosters) the card has a lot more affordable prices compared to the original. Well over the course of the last few years prices for many cards from Magic’s earliest sets (Alpha, Beta, Unlimited, Revised, Arabian Nights, Antiquities, Legends, and The Dark) have all started increasing in price regardless of what price the card was before the spike. This is being done by collectors looking to complete a set, and sit on a card game as an investment (emphasis on game), plus people possibly looking to play older formats like 93/94. As you can see above there are no decks in other formats playing this card so the price currently seems really artificial. Let’s look at a card that is actually seeing play in one of the more commonly known formats. The Tabernacle at Pendrell Vale is a card from Legends that is an important part of the Lands deck in Legacy. Currently it’s only a 1-of, but why has it spiked as much as it has especially in a format that seems to get less & less coverage (let alone new players) every year? The 93/94 is partly the issue, but the banning of Sensei’s Divining Top a year ago as well as the printing of Leovold, Emissary of Trest has caused Deathrite Shaman decks to rise to the top of the Legacy format. Lands has been one of the best decks to combat it, and interest in the card also helped the spike. However the card going up nearly 3 times it’s price from a year ago ($1200 – $1300) seems like quite a leap for a singleton card in a deck that is in a format that has a large barrier to entry. This is where market manipulation comes into play, and if you want to play this card you have to pay big time. When this happens it limits options for players in a format, and also reduces access to a strategy that can combat the best deck which could place the format out of balance by some measure. Now before we continue you may be saying to yourself that you could not afford a Tabernacle a year ago, however if you base finances off an entire year instead of at the moment there are ways that you could afford a card without trading other cards away. Let’s say you get paid weekly at your job. If you were to save $25 per week for 52 weeks you have $1300 saved up. That’s a lot of money, and honestly while I may not put that into one card it’s just a point to show that cards can be affordable. …and that’s just a few. Now I know I may be fortunate than others, especially those who have only started playing in the last 2 years (or less), however by planning ahead as well as staying focused you too can build a collection of decks to play in tournaments. Sadly unless something is done to address the accessibility of older cards nothing much can be done to address market manipulation. We all hate talking about this don’t we? It sure is a hot button topic, however the Reserved List (RL) has been a major influence on the recent market manipulation, and price spikes overall. The RL was created shortly after the printing of Chronicles, which was the first reprint set to provide cards from Magic’s early history to players who have recently joined. Released in 1995 the set featured all white boarder cards, and was meant to be a “Best of 1994” type of set. Wizards of the Coast (WotC) was even careful to avoid printing very powerful cards while only focusing on the limited print expansions of Arabian Nights, Antiquities, Legends, and The Dark. Nonetheless those who collected the cards were afraid that other cards could be reprinted ruining the value of their original prints (and their investment), and made their voices clear. WotC then created the RL. “Wizards has no plans for another reprint expansion”. Obviously this decision has been reversed with no uproar as they did provide us Modern Masters in 2013, and have provided various reprint sets since without any complaints (aside from what may have been excluded from such sets) since. This point will be very important later in this section. Now keep in mind the issue with Chronicles, and it’s aftermath, happened in 1994 when Magic held it’s first World Championship. The format at the time? Type I, which is now called Vintage. There were no other formats until later, and Legacy wasn’t a format for nearly another decade after this happened. However Magic, and interest in the game, was in it’s infancy then and thus did not have the wide appeal it does now (or even 10 years ago). Cards from Legacy were not highly sought after until coverage of the format became predominant on several streams on Twitch, most notably Star City Games around the turn of the decade. While Legacy is not as covered as it used to be with the increased interest in Team Constructed events (where teams of 3 players each represent the formats in Standard, Modern, and Legacy) Legacy still sees some measure of coverage. One of the biggest issues is the barrier to entry. As with any other decks one needs lands to play. With only 4 versions (Alpha, Beta, Unlimited, and Revised) of these lands available slowly they all have increased in price, and still continue to rise to this day. The more they go up in price the fewer new players can enter the format unlike Modern. Can WotC do something about this? Should they? Let’s discuss. The RL has not been locked in stone since it’s beginning as it has been revised several times through the years. Initially these revisions were due to new sets coming out, and they reviewed each set to choose to either add a card to the RL, or allow reprinting in Core Sets. Initially Core Sets (especially starting in 5th edition) were reprints only allowing the original black bordered printings to maintain a sense of being a collectible or limited item . However even some players had issues with that policy over time. All cards from Alpha / Beta that had not appeared in Fourth Edition or Ice Age. All uncommon and rare cards from Arabian Nights and Antiquities that had not been reprinted in white border at that time (i.e., that did not appear in Revised, Fourth Edition or Chronicles). All rare cards from Legends and The Dark that had not yet been reprinted in white border. WotC reserved the right to reprint cards from Fallen Empires, Ice Age, Homelands, and subsequent limited expansion sets, as well as cards from Chronicles. In order to maintain the collectibility of these products, however, they would reprint in white border no more than 25 percent of the rarest cards. At least 75 percent of the rarest cards from each of these sets would never be reprinted in either black or white border. 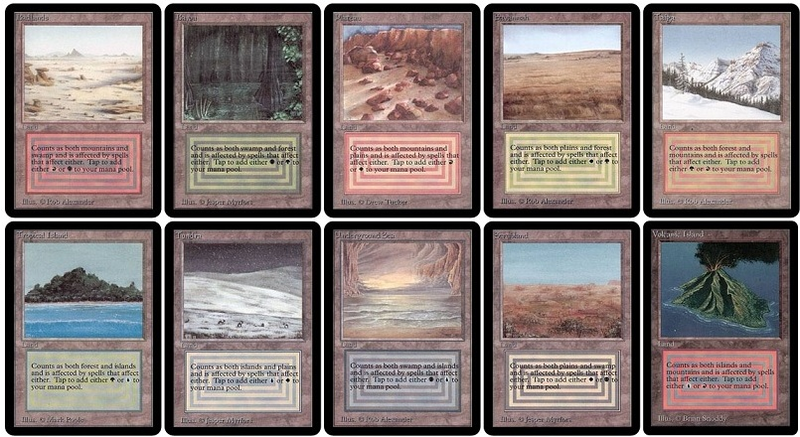 For this purpose, the rarest cards from a given expansion set were defined as those appearing with the lowest frequency on the rarest print sheet used to print that expansion (i.e., cards from Fallen Empires, Chronicles and Homelands designated U1 and cards from Ice Age designated R1 in The Duelist magazine’s cardlists for these sets). In conjunction with the release of each new core set, such as Fifth Edition, WotC would announce which sets were considered eligible to have cards from them rotated into the core set. Any rare card from those sets not rotated into the core set at that time would become a Reserved Card and thus would never be printed again in black or white border in game-functionally identical form. In 2002’s revision WoTC decided no cards from the Mercadian Masques set and later sets would be reserved. Commons and uncommons from Limited Edition were removed from the reserved list due to overwhelming public support for this change. In consideration of past commitments, however, no other cards would be removed from the list. The exception was Feroz’s Ban from Homelands, which was reprinted in Fifth Edition but (mistakenly) still on the Reserved List at the time. It was also removed. The original policy only applied to non-premium cards, meaning that Reserved cards could still be reprinted as a premium-exclusive card. When this was applied to Duel Decks: Phyrexia vs. The Coalition (Phyrexian Negator) ‎and From the Vault: Relics‎ (Mox Diamond) the Magic community’s reactions were to a large extent negative. Starting in 2011, no cards on the reserved list would be printed in either premium or non-premium form. So what does this all mean? It means they have the power to do as they wish. The can, and have made revisions to the RL several times. They have even went back on statements publicly made about reprint sets (as mentioned above with the quote from Bill Rose). If they want to allow access to cards for players to play throughout Magic’s history this should have been the year to do it, and there’s still time. However HOW could they do this? With another edit of course. Review the list of banned cards in Legacy here. Compare that list to those currently on the Reserved List here. Take the cards not banned in Legacy that are on the Reserved List off of the Reserved List. Make a statement indicating this would be the last edit. Showing off new art: Using the MTGO art for the original dual lands would allow exposure to many talented artists who have joined Magic over these last 25 years. Print card with the new (M15) border to prevent counterfeiting. Foil versions of these cards would help negate the “Kess” issue (this is where cards from supplement sets such as Commander have only a foil printing, and can possibly be seen in the deck). Standard card singles from Dominaria are $40 – $60 a card (depending on the card), and have not negatively impacted attendance, store sales, or interest in the game. It can withstand singles prices of $100 for reprints of dual lands in reprint sets. Yes I understand this may hurt the value of original cards, but will it truly? Cards like Liliana of the Veil, Horizon Canopy, and Noble Hierarch have maintained (or even increased) in value in the face of being reprinted. However let’s look at this from another angle. Comic books were (and still are) collectible long before there was a Magic or a Gathering. They, along with Baseball Cards, are some of the most commonly collected items among those who collect anything. How much do you think the first copy of X-Men #1 is going for now? A lot. In 2012 a very fine condition sold for nearly half a million dollars. When was the reprint in the Marvel Milestone released? You can still get the reprint (which has the same story, and advertisements as the original) for about $2 now. So you see an EXACT REPRINT has not really hurt the value of the original, but more than likely helped it as it brought a renewed interest to the original stories, and many of those who became interested in the X-Men during the early 90’s probably started collecting back issues to have the originals. There are many who would sue WotC if they did this, and regardless if the lawsuit was foolhardy or legitimate the negative press could wipe out this upswing in what WotC has done this last year (I’m sure Hasbro doesn’t want that either). The collectors are sitting on the cards they have due to their estimated value being a collectible, but are not selling right now (similar to how a home owner is worried about their property value although they may never sell their home). Their interest is in the value of their item that gets more rare with each passing day. That would be a statement they would release, and with these new lands from Battlebond (coming out next month) that seems to be the case. Their focus is to provide new product, and bring new players to the game. This has been quite relevant with the (multiple) changes they have made to Standard the last 4 years, the addition of Brawl, and more supplementary products each year. Once you are invested into the game then the choice of what to do (how to, and what to, play) is solely on the player to choose. While this stance may not be ideal for the future of eternal formats such as Legacy, or even the Masters Series as a whole, it is a very precarious situation that WotC finds themselves in and definitely not easy regardless of which way they go. Do nothing (staying the current course) and older cards keep getting more expensive with no end in sight. Do something, and receive negative backlash. I don’t envy them at all, but this is where we are. Thank you all for reading. What are your thoughts? How would you address these issues? Let me know in the comments below, and please follow me on Twitter as well as Facebook. Previous Speaking Casually: Take Flight With Esper Dragons.